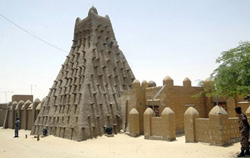 A member of the movement’s media committee had stated that they will destroy everything, even the shrines found inside the mosques, and that later, they will destroy all the other shrines found in Timbuktu city. Previously, some Fatwas that deem permissible the act of destroying shrines, including those of the guardians and the righteous, were circulated based on a certain Ijtihadi interpretations of some Hadiths narrated on the account of the Prophet (p.). His Eminence (ra) further points out to the issue of imposing an opinion and trying to apply it in reality regardless of the repercussions of this imposition at the scientific level, for science and Ijtihad accept the other opinion and there is no room in Ijtihad for the dictatorship of making one opinion prevail, for that induces the paralysis of the intellect and creativity at the level of Ijtihad itself… Moreover, there are several negative repercussions for actually forcing others into adopting an opinion, for it disturbs the entire Islamic reality and places it in a state of chaos and regression…. His Eminence (ra) also relates that many Muslims visit the shrines of the guardians and salute them without committing an act of idolatry and ascribing partners to Allah. As for the negative behaviors in this regard, they are criticized and denounced by many aware religious scholars. His Eminence (ra) warns that the Fatwas regarding destroying the shrines are controversial and they should be dealt with first through dialogue among the religious scholars to come out with an Ijtihadi solution for the issue, for things cannot be left untreated in the reality that already suffers from several points of weakness through which the evildoers infiltrate to create dissension and strife among the Muslims. It is worth mentioning that a cultural war is waged in the name of religion against the principles of the Islamic faith, regardless of the different Islamic schools of thought, reaching the level of threatening the very existence of Islam.